Janice has written two of the best permanent weight loss books you’ll ever find! OLofWL is on Oprah’s reading list, self-help section! As millions of women can attest, losing weight is hard work, and even the most resolute of dieters often fail. What’s missing from nearly every diet program is the support and humor women need to keep on track and lose those pounds for good. Here, Our Lady of Weight Loss—the patron saint of dieting—comes to the rescue with miraculous motivation for all! In this unique book, Our Lady shares her tried-and-true gospel of weight loss guaranteed to lift readers’ spirits and finally make dieting fun. 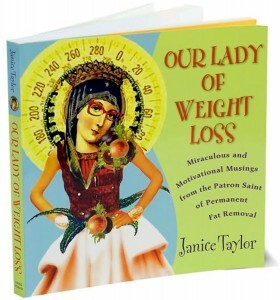 A fat-free, calorie-free, carb-free, guilt-free helping of divine inspiration, Our Lady of Weight Loss is the ultimate cheerleader for women everywhere and the best friend who will keep them on course even when the brownies beckon like a siren. Quirky and soulful, with gorgeous four-color artwork throughout, these book will keep readers laughing on the rocky road to sveltesville and change their relationship with food forever. The road to sveltesville is paved with Our Lady wisdom! In Our Lady of Weight Loss, Janice Taylor put a new, creative spin on weight loss, offering humor and art projects to make slimming down fun. Now, in All Is Forgiven, Move On, Taylor takes us on a journey to Sveltesville, the magical place where we can free ourselves from the food and weight madness for good. As Taylor explains, to change our bodies we need to radically shift our attitude, get out of our ruts, forgive ourselves for past sins, and move on with a positive outlook. 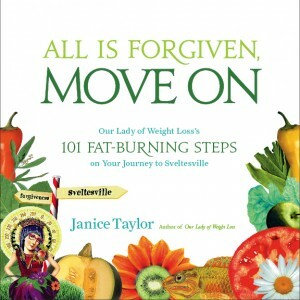 All Is Forgiven, Move On is not just a road map for weight loss. It is a journey of reinvention where food is not the main course. With gorgeous and uplifting four-color artwork throughout, this book is for anyone who is ready to make this time the time and reach Sveltesville once and for all.